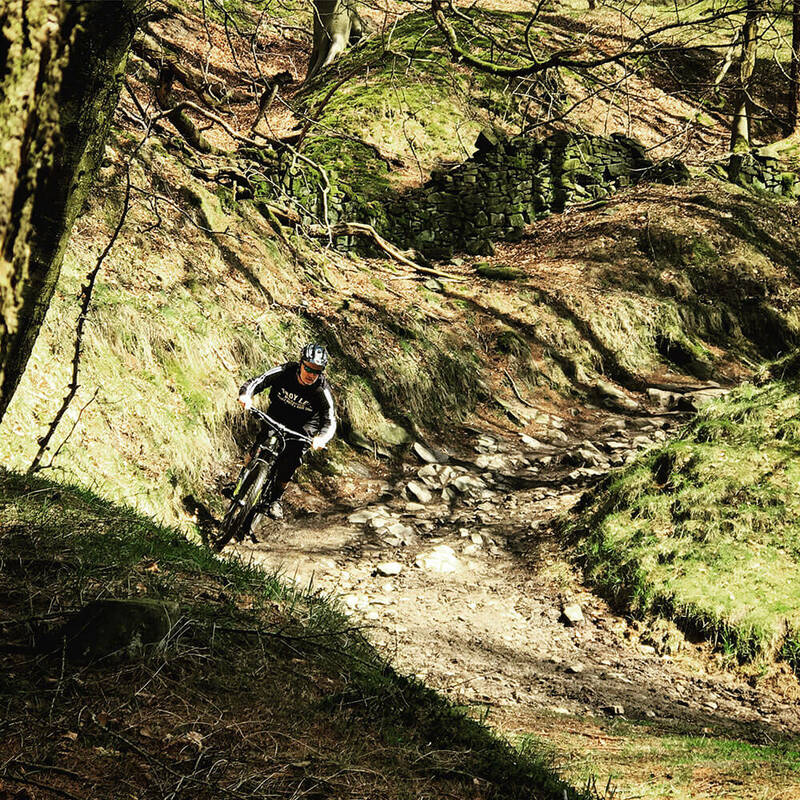 Two days of guided riding on some of the best terrain the Dark Peak has to offer. Friday and Saturday night bunk-house accommodation, perfectly placed in the heart of the Dark Peak. Our own room with sleeping for up to 10 people. The accommodation features a kitchen, secure bike storage and on-site parking. At least one of the two days we’ll ride straight from the digs. A 2 course meal at a local, cosy pub on Friday and Saturday night are included in the price, as are the breakfasts and packed lunches for Saturday and Sunday. Breakfasts and lunches will be catered by local bakeries, cafes and delis. We’ll arrive Friday evening, ride Saturday and Sunday. Depart Sunday evening. Total price: £265 per person. For dates and booking, see the booking form below. You can secure a place with a 10% deposit. A functional mountain bike. Hardtails are OK but the trails are rocky, and easier on a full on a full susser. More important is that your bike is good condition. The rocky descents in the Dark Peak can be tough on bikes; anything that's on its last legs is likely to fail. Ideally you'll be riding on tubeless tyres with reinforced sidewalls. Lightweight cross country tyres are likely to puncture. A reasonable level of fitness. We'll be riding for up to 6 hours off-road and often on steep terrain. We'll take it steady and nobody will get left behind. If you have any questions or concerns, please get in touch. Intermediate skills - You're happy with a trail centre reds. For any features or descents that are more challenging, I'll make sure you're aware of them. You can choose to ride them (I can coach if required) or push round them (no shame or peer pressure here). Both Saturday and Sunday’s rides will have: a lot of climbing, epic views & exhilarating descents. The actual routes will be determined closer the time based on local weather and trail conditions. Saturday will be at least 30K with a minimum of 750m of climbing. Sunday will be similar, possibly slightly shorter. Both days will feature classic descents from my all-time top 10 favourites in the Dark Peak. You can pay the full amount or a deposit of 10% or more. The balance for deposit payments will be required 6 weeks before the event. If it’s already less than 6 weeks until the event, please pay the full amount.